Let’s face it: Photoshop Mobile is a joke. It’s not really an image editor as much as it’s a tweaker, an app that’s just about worth its free price tag and doesn’t really live up to the Photoshop name. Now that tablets with the screen real estate and horsepower to take advantage of more traditional photo editing exist, Adobe wants to take advantage of them with Photoshop Touch for Honeycomb. The app features a full-screen interface that mimics the tools of the desktop version of Photoshop, while still staying relatively finger-friendly. Basic functions like rotation, crop and various color corrections are easy with advanced warps and modifications also possible. Most exciting is that Photoshop’s robust selection and layer tools seem to have made the mobile transition intact, making truly useful image manipulation possible. The app also takes advantage of tablet hardware for live video layers. Perhaps the most exiting part of Adobe’s announcement is that the Android app will cost just $9.99 in the Market. Considering that you’re getting a solid chunk of the functionality found in Photoshop Elements on a relatively new platform, that’s a downright steal. Couple Photoshop Touch with a cheap capacitive stylus, and all of a sudden you’ve got a full-on digital drawing tablet at a fraction of the cost (and to be fair, a fraction of the functionality) of hardware like the Wacom Cintiq. 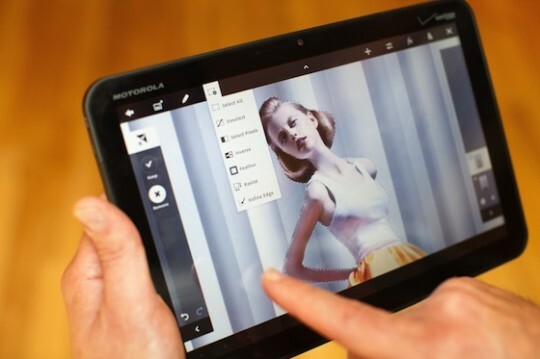 Photoshop Touch will release sometime in November for Android, with an iOS version to follow. How often do you get to hear that, Android fans? It’s part of a small suite of apps including Collage, Debut ( a presentation manager), Proto (simple website designer), Kuler (color manager) and Ideas (vector editor – why not just call it Illustrator Touch?). All six apps will work with Adobe’s Creative Cloud system, so you don’t have to keep local files on your tablet.